In the span of few days, George Kent announced 2 new contracts that probably will enhance its group's earning moving forward. The first one was the LRT 3 contract awarded by Prasarana Malaysia Berhad. The group and their JV partner, MRCB are the Project Delivery Partner (PDP) to build the LRT 3 from Bandar Utama to Johan Setia. Total development cost is around RM9 billion. Construction work will begin in early 2016 and expected to be completed in Aug 2020. The JV will get 6% management fees. So, George Kent probably will get around RM270 million for the whole project, which translated into around RM45 million annually. I not sure whether this RM45 million is considered as operating profit or net profit. To recap, the group's net profit for the past 3 financial years was RM25mil, RM36mil and RM28 million respectively. Nevertheless, the annual RM45 million from the said project will contributed significantly to the group's bottom line. The second contract was the delivery of 600k units of water meters to Water Supplies Department (WSD), Hong Kong over the next 2 years for a total sum of USD7.17 million which is roughly RM31 million. From the press release, the group stated that this contract is the largest single order for the water meters division which further enhance their reputation in the meter industry. The meters will be delivered in 24 batches and the first shipment is in Oct 2015. In another statement, the group anticipated the contract will contribute around 0.29 sen for financial year end 2016. That's 4 months contribution since the first batch is to be delivered in Oct.
0.29 sen is equivalent to RM871k in 4 months. So, estimate the 2-year contract will contribute RM5.2 million to the group's bottom line assumed the delivery is constant throughout the years. Ignore the USD fluctuation, profit margin will be 5.2/31 = 16.7%. Strengthening of RM against USD of course will affect the earning. So moving into next year,earning will be quite certain unless there is delay in the construction work for the LRT 3 project. For the rest of the current financial year, do not forget the contribution from the Ampang extension line and the stable contribution from the meter division. OpenSys just announced its 2QFY15 result last week. At first glance, it was a bit disappointed as I afraid the good performance recorded in the first quarter may be one time off did come true. To recap, there was a jump in CRM machine sales in previous quarter. It was a normal quarter for the group, just the selling and distribution costs increased 20% compared to previous few quarters. I have no idea about the spike. It may due to higher marketing activities to improve the sales during the quarter. The main highlight is the group able to reduce its net debt/equity ratio from 23% in the previous quarter to 1.8% only this quarter thanks to better operating cash flow that resulted in higher cash balance. From the segment reporting, it's good to see that the software outsourcing division was able to maintain above RM8 million revenue. Since the profit margin of the said division is much higher as well as the income is recurring in nature, the profit certainty and consistency are there. Sale of machines is one time off and low in profit margin, but a small increase in net profit will help to drive up the EPS significantly like previous quarter. The group also announce dividend and 1-3 bonus issue. Is CRM still the key moving forward? I think so but the pace of converting it may not be that fast. Recently few banks are implementing VSS to cut operating cost. So, hopefully they are going to replace the ATM with CRM and also outsourcing their cheque deposit machine to third party to reduce manpower costs. Combine the quarter results and looking back at my buying price, it did not serve much margin of safety. I may wait until next quarter or dispose it to buy other counters when opportunity arises. Still tempting. August is a suffering month for me. The feeling is not good when you see so many counters in red color and you're having unrealized loss. 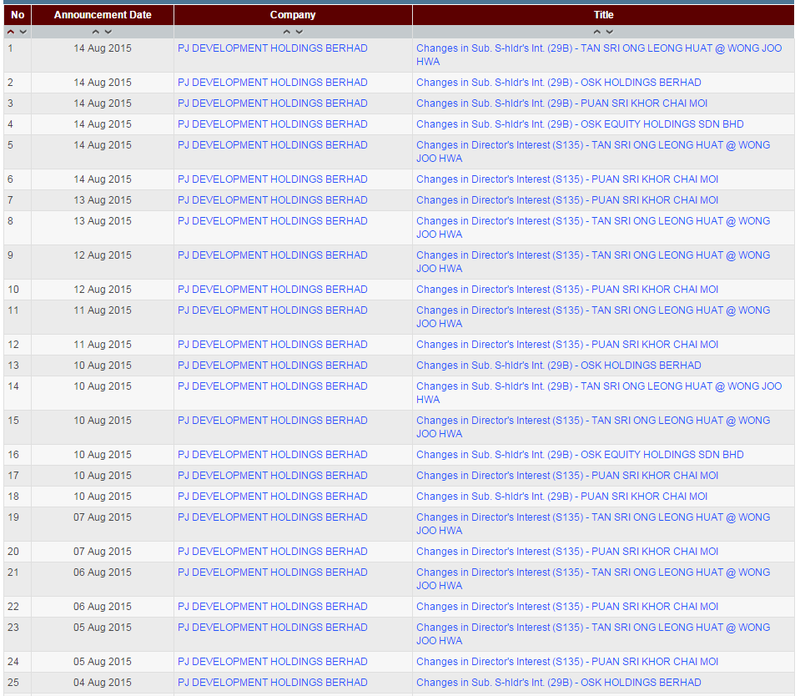 For local, I sold off PJDev and half of my holdings in Puncak and Gkent to reserve some cash. Others stay the same. 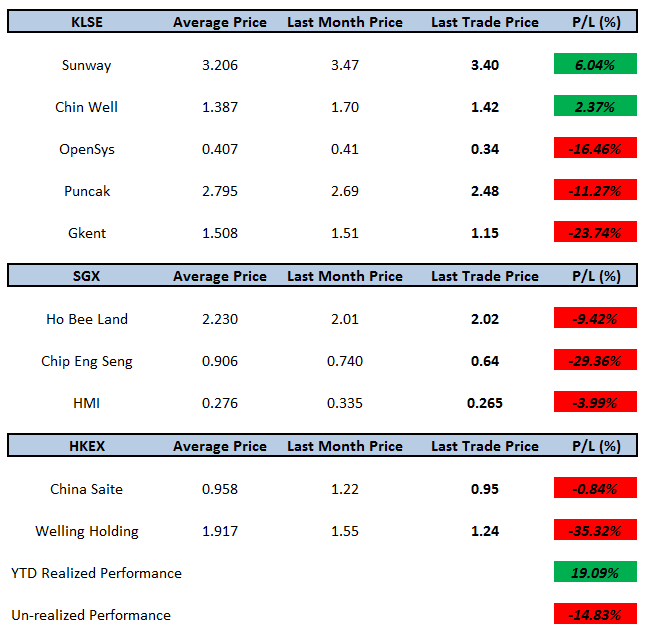 For Singapore, CES and HMI continued its slide in share price. Ho Bee still staying strong with some buy back from the company. All three companies reported satisfying quarter result last month. For HK, share price of both China Saite and Welling Holding continue to drop. Both companies reported slight drop in net profit for the first half of the year. Unrealized performance dropped into red zone, mainly due to CES and Welling Holding as their weight percentage are higher. Dividend yield is quite high given the share price now, but dividend declared by CES this year involved special dividend which may not sustain to next year. Overall cash level is around 35%. I think I have to better utilize the cash in order to recoup the losses. Meanwhile, learning some technical chart through OTB subscription and also study the companies recommend by him. Mostly export-orientated and technology company. For HK stocks, still keep studying companies although the pace is not as fast as I wish. Sometimes kinda lazy and procrastinated. PJ Dev just announced its latest quarter report last week. I think its result disappointed many of us. And shock as well. There was a one-off gain of asset disposal at corresponding quarter last year. I just deducted it out at operating level and net profit level for comparison. So, probably would be slight difference in reality. The group managed to record RM5.7 million net profit, poorest in 2 years. Both revenue and operating profit margin also dropped. Even worst is there was RM7.8 million loss in joint venture this quarter. Net borrowings increased to RM362 million from RM135 million one year earlier. Net gearing ratio is around 0.3 which I think is still in comfortable horizon for a group whose main focus is in property development. Interest expenses increased two-fold from previous financial year. 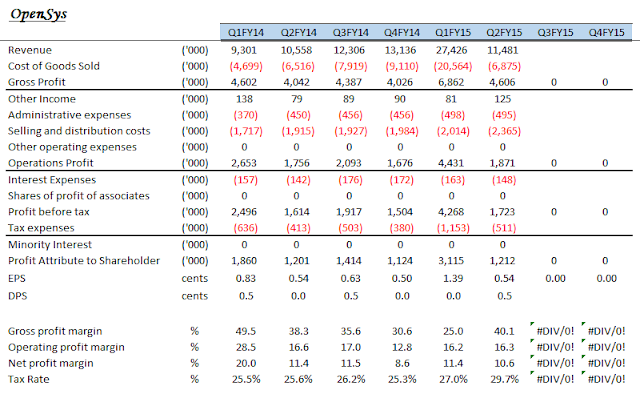 Cash flow without doubt was negative due to significant outflow for the increases in land held and property development costs probably for Yarra Park City project that caused the group to take up massive borrowings. Segment reporting provides some clues on the drops in performance. Found out that the group's account statement changed quite much after audited. Q4FY14 result released last year was quite different from the pass year result shown in Q4FY15. Poor performance from the properties segment was due to delay in launching Cheras You City and Genting Windmill Upon Hills projects. But the group did mention that the take up rate in the respective Genting project was quite good after launched as well as voiced out concern regarding the slow down in the overall property market. Both cable and building material divisions recorded lower revenue and even worst was the hotel segment continued its loss from last quarter. Construction segment was the only bright spot. The group's prospect mentioned in the report doesn't sound quite good too. In another event, there was a statement stated that OSK Holding is deemed to have the control of the company even through OSKH has less than 50% of the voting right. But, the parent company probably will have more than 50% equity interest by the closing date. All in all, I probably will dispose my holdings in the group after some consideration. I think the share price will getting hard to reflect its high asset value after the acquisition/transfer end. It's such a waste as I owned it for a while and there was opportunity cost involved. After glancing through the quarter report, I think the result was quite moderate and a bit below my expectation. Revenue increased marginally if compared to corresponding quarter last year. Unfortunately, its gross profit margin dropped significantly from 24.8% to 16.5%. Even coupled with lower administrative expenses and marketing expenses, the group posted much lower net profit in the end. Since the acquisition was completed at previous quarter, the group does not need to share the result to the minority parties anymore. Assumed the group taking full control since the beginning of the financial year, full year EPS would be RM49.4 million net profit divided by around 300 million shares, which equivalent to 16.46 cents. PE is around 8.5. 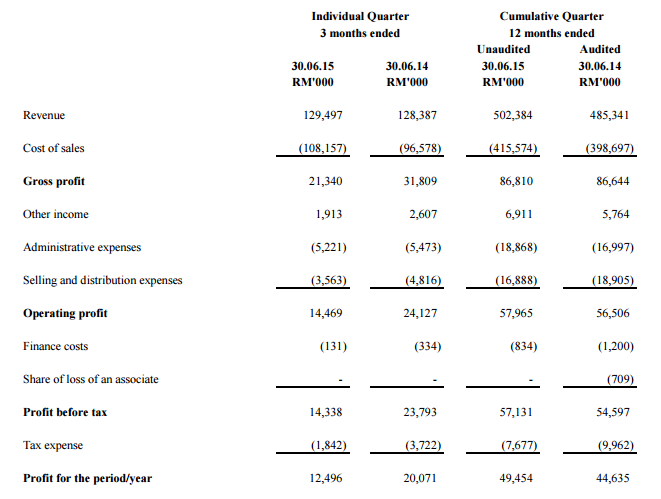 In terms of balance sheet, one thing to highlight is the group able to reduce its net debt position from RM25 million to net cash of RM2.1 million even taking into account of RM8.3 million to pay for the acquisition. That's a very healthy sign. This was contributed by its strong cash flow and positive high free cash flow. Minor set back was the group made an inventories write-off of about RM4.5 million. 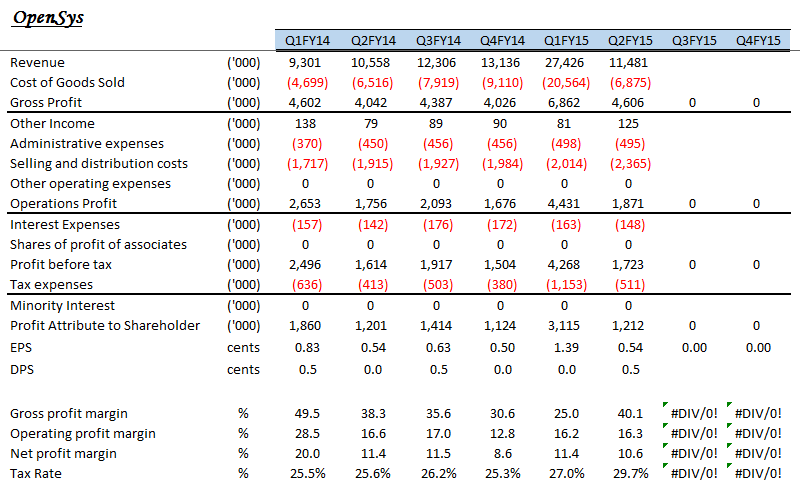 Fasteners segment posted poorer result this quarter. Management explained that it was due to demand slow down in European countries as well as product mix that generated lower profit margin products. Surprisingly, the Wire segment posted a loss in this quarter. I expected it to post a good result due to new product of panel fence being launched. But things went to the other way as revenue dropped. Management also did not mention anything regarding the DIY products that the group emphasize all this while as DIY products fetch higher margin. In summary, it still depends on its growth prospect in the Fasteners segment and its stability in the Wire segment. At a PE region of 8-10 may not provides much growth in the share price as current sell down in the market caused many companies selling at cheaper price and higher dividend yield. I get little bit confused when I read LCTH's 2014 annual report regarding its Local and Export segment reporting. At first glance, more than 90% of the group's products were export to other countries. The strengthening of USD would be a happy situation to the group. But when I read the definition of Local and Export market given in the annual report, it's noted that local market refers to customers within Malaysia who are non Licensed Manufacturing Warehouse. For those customers in Malaysia who are LMW are considered as Export market as well as overseas customers. I checked through online and found out that Licensed Manufacturing Warehouse (LMW) is a premise licensed under section 65A of the Customs Act 1967 and is directly control by Royal Malaysian Customs. It is control by way of documentation and subject to all customs rules and regulations. Licensed manufacturing warehouse is a facility provided for export oriented companies too. Though I not very understand, I guess it's a register platform for the company to export the products oversea. Based on geographical information, RM91.45 million revenue was from Malaysia. Minus out RM4.69 million from the Local Market, thus RM86.76 million was related to sales to LMW in Malaysia which equivalent to 68.8% of overall sales. While the direct sales to overseas market (SG, US & others) accounted to RM34.59 million, which equivalent to 27% of overall sales. So, question remained is sales to LMW in Malaysia is denominated in RM or USD? 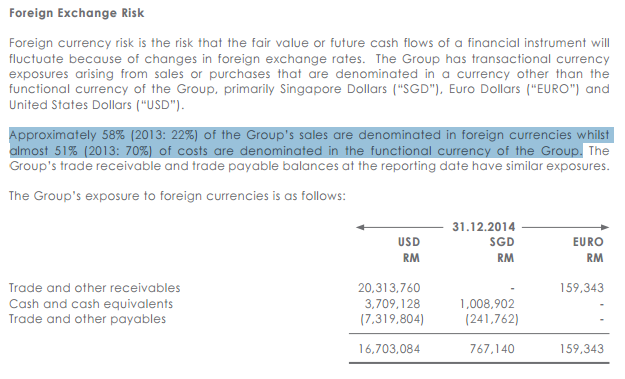 I flipped into Foreign Exchange Risk section, management highlighted that 58% of the sales were denominated in foreign currencies while around 51% of costs were denominated in RM in FY2014. So, estimated half of the sales to LMW in Malaysia was denominated in foreign currencies. (Just rough estimation after minus out 27% direct sales to overseas market). One thing is confirm is 58% of group's sales are denominated in foreign currencies while half of its costs are denominated in RM. That is a good thing in this RM weakening trend although the variation was quite high compared to previous year. Another sure thing is the group's USD denominated receivables was higher than its payable. That's good for the group moving forward too. So, the strengthening of USD works well for the group though not to the great extend at first glance that more than 95% of overall sales were for Export Market. 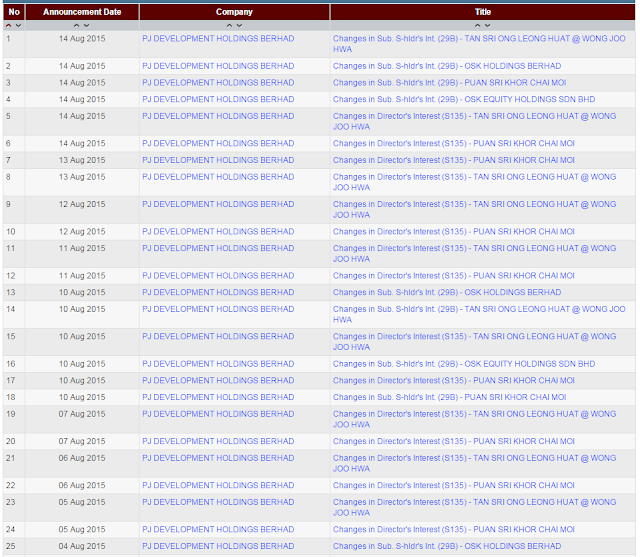 For the past one two weeks, I guess everyone who pay attention to PJDev's announcement in Bursa website probably has no difficulty to note that OSK Holdings Berhad had keep on acquiring PJDev shares through open market. From the first transfer of shares on 23-July, Tan Sri Ong Keong Huat had acquired PJDev shares through open market almost non-stop until today. The transacted price was around RM1.55, slightly lower than the offer price. Up to date, the number of shares acquired by OSK Holdings Berhad through open market is 31.46 million shares. His ownership in PJDev now is around 38.52% from 31.59%. With average transacted price of RM1.55, total purchasing cost is RM48.76 million. To make it as OSK Holdings's subsidiary instead of investment in associate? In order to have at least 50.01%, OSK Holdings need 11.49% ownership more. That's equivalent to around RM80.77 million more. But do not forget PJDev at the latest quarter had RM150million cash on hands, RM253million property development costs and RM557million of land held for property development as well as RM600 million unbilled sales in hands. Though they have around RM520 million in borrowings. So, another good asset being steal away? Can offer better price or not? Or investors should directly buy OSK Holdings? Let's see what is the outcome when the mandatory takeover offer end in few weeks time.